Sometimes buyers avoid hybrids for the wrong reasons. But, for some buyers, their worries are well founded. NEW YORK (CNNMoney.com) -- When they're thinking about buying a hybrid vehicle, people sometimes worry about stuff that's just silly. Sometimes, though, they're absolutely right to be concerned. In a survey done in cooperation with Harris Interactive, Kelley Blue Book's Web site, KBB.com, asked car shoppers who were considering a hybrid what worried them about the vehicles. We've evaluated the top seven concerns -- for all of them, at least two-thirds of respondents were "somewhat worried." To be fair, every car today has complicated technology that's difficult to fix. The old days of listening for a funny noise then taking a wrench to the problem are long gone. Today's cars are packed with complicated electronics and computer chips. Still, working on a hybrid car will require some special training that your corner mechanic probably won't have. For the time being, you'll be taking it to the dealership for any needed repairs. And even the dealership may only have one or two mechanics trained on hybrids. 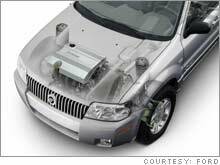 As far as expense goes, the hybrid-specific components of most hybrid vehicles have extremely long warrantees, so cost shouldn't be an issue. Simple maintenance, like changing the oil or brake pads or rotating tires, can be done by your neighborhood mechanic, pointed out Tony Mossa, a spokesman for the Institute for Automotive Service Excellence, a group that certifies professional mechanics. As far as those sorts of things go, a hybrid vehicle presents no special challenges. Just make sure to keep careful records for warranty purposes. Conclusion: It's a slight concern for now. Unlike cell phone or laptop batteries, hybrid batteries go through their entire functional lives without ever being fully charged or discharged. Hybrid vehicles run on a regular gasoline-powered engine assisted by an electric motor. The electric motor's battery is charged by the gas engine during braking and idling. So, hybrid car batteries are designed to move energy in and out quickly and efficiently, said Tom Watson, Hybrid Propulsion Systems Manager for Ford Motor Co. Both Toyota and Ford claim to have hybrid vehicles in fleet use that have lasted well over 100,000 miles -- Toyota claims a few vehicles with over 200,000 miles. Besides, typically there are extremely long warranties on hybrid components, including batteries. Toyota guarantees all hybrid-specific components on their vehicles for 10 years or 100,000 miles. Ford guarantees them for 8 years or 100,000 miles and Honda for 8 years or 80,000 miles. Conclusion: Not a major concern. This concern stems from a Toyota Prius recall last year. Priuses' gasoline engines would sometimes shut off during highway driving. Fortunately, the cars still had electrical power sufficient to drive a few miles while maintaining power for steering and braking systems. The problem was a software glitch. All hybrid cars turn off their gasoline engines under some circumstances, such as when the vehicle is momentarily stopped at an intersection. The Prius was shutting off its engine at the wrong time. Owners of affected vehicles were instructed to take their cars to the dealership where new software was installed that fixed the problem. All Priuses made since have the new software. Conclusion: Not a real concern. Non-hybrid cars get recalled sometimes, too. According to most analyses, including a recent one by Consumer Reports, it would be difficult to justify purchasing a hybrid for economic reasons alone. Even if gasoline costs continue to rise, according to Consumer Reports analysis, only the Honda Civic Hybrid and Toyota Prius could be said to save money over a five year ownership period once all costs are factored in. And even in those cases, the savings involved are $80 a year or less. You could save more by simply accelerating and braking more gently in your current vehicle. The two biggest reasons that hybrids don't save their owners money are the higher initial cost and fast depreciation. Conclusion: A legitimate concern. Don't buy a hybrid just to save gas money. Even if you save some money, it probably won't be much. It depends on which hybrid vehicle you're talking about and what your driving performance "need" is. Hybrid powertrains are more fuel-efficient than non-hybrid ones. That means they can get more power out of the same amount of fuel. So a car can use a smaller gasoline engine while offering the same performance as a car with a larger engine. It also means the vehicle can use the same sized engine more efficiently while also gaining a little extra power and quickness, as with the Honda Accord Hybrid or the Toyota Highlander Hybrid. When tested by CNNMoney.com, the difference in power between the regular V-6-powered Highlander and the Highlander Hybrid was quite noticeable. The Highlander Hybrid offered more responsive acceleration. On the other hand, vehicles like the Toyota Highlander Hybrid don't save as much fuel as they could if they were equipped with smaller gasoline engines. Vehicles that do have smaller engines, like the Ford Escape Hybrid and Honda Civic Hybrid, still offer power that's more than adequate for daily use, including merging and passing. You won't blow anyone's doors off, but you also won't waste quite as much of your life pumping gas. Conclusion: You have to choose your priorities. Don't be fooled by stories about used Toyota Priuses selling for near-new prices. The Prius is a unique, hybrid-only vehicle with an eye-catching design. It's produced and sold in low volumes. It's high resale value has more to do with those factors than with the simple fact that it's a hybrid. In terms of holding its value as a used car, the Prius has more in common with the Mini Cooper, another resale value champ, than a Ford Escape Hybrid SUV. Like the Escape, most hybrid vehicles are versions of ordinary, non-hybrid vehicles with little to visually distinguish them. Conclusion: A genuine cause for concern. If, by "promised," you mean "EPA estimated," they certainly don't. And neither will anything else. The problem with hybrids, though, is that even though all vehicles might get about 15 percent fewer miles per gallon than the government says -- that's one common estimate -- 15 percent of a big number is a far larger miss than 15 percent of a small number. At any rate, if you're calculating how little you'll spend on gas by looking at EPA estimates, you're probably underestimating by a wide margin. But something interesting happens if you look at gallons used per 100 miles instead of looking at miles per gallon. When you look at things that way, you'll see that if every vehicles gets 15 percent worse fuel economy than EPA estimates indicate, that actually widens the margin between more and less fuel efficient vehicles. So, you may be spending more on fuel than you expected but, at the same time, you may be saving more than you thought. Conclusion: Assume that it won't. But neither will anything else. This story was updated in September, 2006 with new information about tax incentives and a more thorough explanation of the effect of fuel economy on fuel costs. Some changes were requested by readers. We would like to thank those readers for their input.